Since this film is somewhat ridiculous, I have decided to write with a less than professional tone (See my Gangster Squad review for a similar example). Warning, sarcasm ahead. 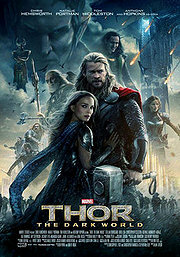 Marvel Studio’s onslaught of high-octane entertainment continues with this year’s Thor: The Dark World. Things may have quieted down on Earth after the Battle of New York, featured in 2012’s The Avengers, but the same can not be said about Asgard. It turns out that the evil dark elves, along with their leader, Malekith have been awaiting an opportunity to strike. What do they want to strike and when do they want to strike it? Well, it turns out the dark elves hate the light and they want to cast the universe in darkness. A perfect opportunity arises when the 9 realms of the universe align, a convergence that only happens every 5000 years causing gravitational abnormalities and bringing about the Yang-Mills anomaly that could open crossroads to universe intersections like the nexus of all reality or, in the case of this film, a fault that starts a cosmic eclipse linking the dark elves’ realm, Svartalfheim, to Earth! The aforementioned cosmic eclipse happens to open right in cutie-pie, scientist, Jane Foster’s (Natalie Portman) backyard. This causes Thor (Chris Hemsworth) to reunite with Foster for the first time in two years. While Foster feels a bit burned by the length of time her supposed love’s been away, it doesn’t stop her from joining him on a spur of the moment jaunt to Asgard in the hopes that she can aid the Asgardians in their fight against the dark elves. Now, don’t get me wrong, I did enjoy Thor: The Dark World, but the fact that I had to write a sentence that included dark elves, Norse realms, convergence, nexus, and cosmic eclipses lets you know that we’re dealing with a film that will not be everybody’s cup of “mead.” Nonetheless, Marvel knows their core audience, and it seems that the Thor franchise is aimed directly at them (or us). However, if you are not a “Thor” fan and are looking for a reason to see this film, you need look no further than Tom Hiddleston as Loki. Hiddleston steals every scene he’s in and since it’s public knowledge that he will not appear I the sequel to The Avengers, Thor: The Dark World is your one-stop-shop to get your Loki fix. Thor: The Dark World is rated PG-13 and has a running time of 1 hour and 52 minutes. As with all Marvel movies, stay tuned during the credits for tie-ins to upcoming films. Thor: The Dark World has a teaser during credits as well as one after credits. Do you think the dark elves were inspired to become scientists after watching Natalie Portman’s amazing portrayal as a woman scientist???? Yes! Little girls (and dark elves) are very lucky to have scientists like Natalie Portman to look up to.